I happened by the place where I went to grade school, the other day. I’d not stopped there in years. No real reason to, that school officials, or the police, for that matter would accept, though I’d driven by the place often enough. Purely on a whim I pulled in. Nobody was around, save the people living around the parimiter of the school grounds, and being mid-winter, I guess they had better things to do… like stay warm, for example. It was a Saturday, so the place was closed up drum tight. As I drove in to the place, I was transported back. I could see my sister and myself walking down the street approaching the school,many years ago, walking back from the local shopping plaza, only a block further way from my house… I’m not sure, when, since I was very young, but it must have been sometime around 1961 or 1962, and I remember cranes lowering the huge steel beams that today make up the roof, into place. I wanted to stay and watch, but she was in a bit of a hurry that day. ‘You’ll be going to school, there’, my sister said, as we walked along. It was a warm day, with some breezes. And I can’t remember how old I was at the time. And I don’t recall ever going back there until the day I started school. I walked the eight blocks to school every day after the first day. Rain, snow sleet, whatever. These days, they bus the kids that kind of distance. Supposedly the concern is they’ll be hit by a car. Back in the present, I parked the truck to the relative left of the shot below, got out and wandered over to the window of one of the rooms I was in for a year, and immediately, the place was both changed and the same as it was. I could have walked though the place blindfolded, going strictly by memory. Well, except for the few places that have changed a bit over the years… the bigger center entryway for one thing. 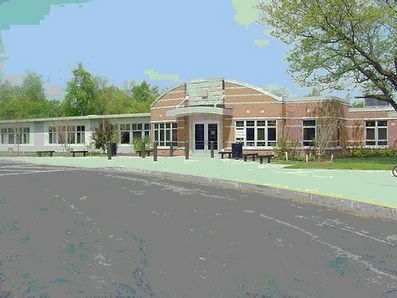 To the left in this shot, is the grades K-3 wing, and to the right is where the cafeteria used to be. Apparently the kids eat in their rooms, these days, as opposed to being herded like cattle to the big, industrial grey room with the small wooden stage at one end, where I ate so many cheese sandwiches. I can still taste the cheese. That big room now houses the library. The library was always a little cramped anyway in the original configuration. The big double door set in the middle used to be recessed some. They’ve added a foyer and some office space. But except for some temporary buildings out back, not much else has changed about the place. The baseball diamond, where I played so many games of kickball, softball, and soccer, is still in the same place. The swings, the old jungle gym is still there, too, though they’ve added a few new ones where the white birch trees used to be. I got to the window of my old classroom… and as I looked into the room though the still-open blinds, I was bowled over by a load of memories… ones I’d not thought of in years. I remember forty-two years ago, amazing the first Teacher I ever had… a Mrs. Madison, by reading her name off the door on my way into class the very first day of Kindergarten. First impressions, you know. I couldn’t figure out what was so special about the simple act of reading, until I noted that many of the kids I went to school with couldn’t. In retrospect, I’m sure I represented something of a threat. My first year of school bored the living pooh out of me as a result of that slight advantage. I’d been there already and wanted to move on, darn it. I don’t remember a whole bunch from that first year, except taking naps, which I considered to be a tremenous waste of my time. I don’t know, but I doubt I ever actually fell asleep. The year ended, and I moved on to the room next door… first grade. I saw Mrs. Madison fairly seldom that next year in my first grade classes and never after that. She took another job someplace else. Assuming she’s still with us, she’d be 70 or 80 years old today, I guess. Now, I should say that school was decidedly NOT my favorite place to be, at any point in those thirteen years. But it amazed me, that despite that dislike, memories, both the vague and the specific, came rushing back. The teachers I had…. Every single one. I had one for third grade that was a real character… a Jewish lady by the name of Ruben. She was strange in her manner and yet the caring came through. After comparing her to others I’ve met, she was the proverbial Jewish mother, in all the postive respects of the stereotype. Mrs. Ruben used to fascinate us with stories of the squirrels in her back yard. Without knowing it, she gave us a view of the small wildlife around us. It’s a lesson I’ve never forgotten. In many ways her manner was of greater import than the academics we did that year. For example…I remember the way she was a calming influence when those huge black-clouded thunderstorms would pop up. “See those beams up there? Those are strong, kids, they’re not coming down”. I suppose I should say that my Dad had always made a point of going out to the front porch to watch the rain and lightning and listen to the thunder. It was all mother nature’s show, as he explained it… free entertainment. To this day, I’ve always liked a good thunderstorm. But calm as I was as a result there was a lot of fear in the eyes of the kids of my class when those storms would come up. But she always managed to keep the class calm, and even used the opportunity for a basic science lesson. A real talent, being able to teach whatever happened to pop up weather wise, or on the calander, and so on. Mrs. Ruben if my memory isn’t too fuzzy would have been close to 50 or 55, and so would be 90 at least, today. Again, assuming she’s still with us. As I stood there in the cold, looking in, I could still remember the kids I’d attended classes with in every year. I remember an end of year party in fourth grade that involved a water balloon. Nobody seemed to know where it came from, but whoever tossed it managed to hit one of the staff with it. In a world that is concerned about weapons and drugs in grade schools, this is perhaps quaint stuff… but the situationw as enough to make about anyone in the class tremble in fear of the repercussions. I remember the support staff. 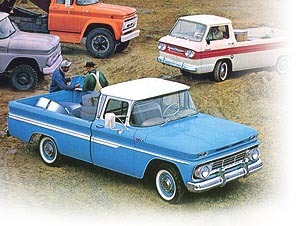 I remember the Janitor who lived just up the street from the school… and drove his nice looking 1962 Chevy Apache pickup truck to work every day. It was exactly like the one pictured in the foreground here except it was mint green. Pickups were pretty rare in those days, and this was a standout even inside that crowd. My Dad always liked a well-kept vehicle, and I learned that from him, and from that I figured anyone who could keep a truck looking that good would be able to make short work out of a mere school building. And in any event, at that age, in those days anyone who drove a truck was the top of ‘cool’. Here was a person you could trust with such things. He knew every child’s name on sight, too. A rare gift. I remember, of all things, the noise the HVAC system’s compressor made, including the funny little squeak it made is it stopped at the end of a pump cycle. It sounds a little different today, to my ear; they’ve apparently changed the system, somewhat. Sound is a very important thing for me; I remember sounds very well indeed. Like, for example, I remember the way your voice echoed in the gym that at the time seemed so large… and seemed even larger as I tried to climb the ropes string from the ceiling…. Something I eventually managed to do… exactly twice. Not being very athletically inclined, I had an intense dislike for the Gym teacher, who obviously felt I wasn’t putting enough effort into things. In retrospect, she was probably right. My disdain for her methods was particularly pronounced when she pulled up the huge Califone record player… The one with the infinitely variable turntable speed, and the cork turntable. Very professional looking in it’s day… and stuck that $%^&# record called “Chicken Fat” onto it. “Go you Chicken fat… go away…” The singer was Robert Preston of all people…. Which today I find odd, since I rather liked Preston. (If you don’t know who he is, think, “Music man” and “The Last Starfighter”. If you can’t play net audio, suffice it to say it was written by one Meredith Wilson, who wrote “The Music Man’ and done in a style that only Preston cold manage).. In a Rock and Roll world, this was NOT cool. But, it was the only record she ever played on the thing. She got the thing out at least twice a year for every class in the school. Making me sweat my buns off on a hot gym floor wasn’t cool either… particularly when I had to go back to my classroom smelling like a goat. To make matters even worse when she thought we weren’t working up enough sweat, she’d take that variable speed Califone up several notches, making Robert Preston sound like Mickey Mouse… with the tempo being faster of course. By the time I left the school the record was pretty beat… I wonder if after I went on to Jr High she managed to find another copy of that thing to clobber younger students with. that gym, and in all the rooms of this place, for that matter. Of course, those victories don’t look quite as large now, as they did then, given the accomlishments in my life since that time… but at the time they were as huge as I took the rooms in that school to be. I can’t help but think how much smaller it all looks today, as I look in through the frosted glass. I remember singing in the school chorus, and making annual treks to the High school in to do what they still called the Christmas Concert. I remember the fear… the sheer terror, of being asked to sing up on this huge stage in front of this even larger room. I was doing all right, … it turned out that I couldn’t see anyone off the end of the stage anyway with all those lights in my eyes. I found I didn’t mind being onstage… and it set me up for a career in radio and as a moble DJ. That Christmas show went along just fine, thank you… until ‘Silver Bells”.. the third or forth song into the routine, when the light board… a 1964 vintage rheostat fader type number, with perhaps 48 channels, blew it’s master breaker… a 100amp job. Well, let me tell you… the resulting clang and the all the stage and houselights suddenly dropping out all at once was enough to bring back the terror. I remember laughing about that incidentin my high-school years, since by that time, I became rather well versed in that particular light board’s operation, and could have solved the problem in a heartbeat. The sound I heard that monster make as a terrified 8 year old turned out to be perfectly normal for this thing, as I later found. Back then, though, the teacher had all she could do to hold herself and her students together through that. It took about five minutes. When you’re eight years old, and scared to death, five minutes is a significant portion of your life. Somehow the lights got turned back on, and we were none the worse for the wear. The Music teacher there was a nice lady, and was a neighbor of a family friend, so she was one of the few teachers during those years that I actually knew outside the school environment. And so the meaning of ‘a freind of a freind’ was taught me, first hand. Well, the school secretary lived around the corner from me, and her Kid was someone I ran into frequently enough… but she wasn’t really a TEACHER, I guess, and so didn’t figure into that equation. She just died recently… my mom attended her funeral, I think. Funny; if it wasn’t for those two relationships, I guess I’d have not been as mindful that teachers have personal lives, too. I guess you never really think of teachers that way at that age.. as if they’re somehow above all that ‘personal life’ nonsense. Or maybe it was just the image they WANTED to covey to us at some level, I don’t know. As I stood there, I remembered the sights the sounds the smells of the place, and the faces of other kids. Most I’ve not seen or heard from in 35 years. But I still remember every one of them. I wonder sometimes if they remember me, and if they do, if it’s a kind memory. Eventually, the cold got to me, and I was forced back into the present day. I realized that I must have looked like a kid in a candy store, looking into the display case… just looking through that window for a good 10 minutes, not moving. Thinking. Remembering. It’s amazing how a place will spur memories you’ve not brught to the waking workd in years. But, I decided I’d better be moving. The neighbors likely wouldn’t be too well disposed to some 50 year old man looking into the school; I’m glad it was winter… because if it’d been summer, they’d have thought I was a dirty old man, looking for some kids to chase and abuse, or perhaps they’d think I was trying to break into the place, or short a few spark plugs. An encounter with the police was not on my agenda that day. The Moody Blues’ Justin Hayward once wrote that “Memories can never take you back home sweet home…. you can never go home anymore.” (sigh) I guess you really can’t go back, for very long. Reality always barges in. Anyway, I was getting cold. No, I never did get the chance to go into the building nor did I expect to. Oh, it would have been nice, but it wasn’t really needed, and given the number of other changes both in reality and in perception. (Good gosh were the rooms always this small? Oops, they changed that, huh?) … Going inside, perhaps, would have been destructive to those memories. As it was, my memories have been refreshed, and yet mostly untouched. And I guess that’s a good thing. 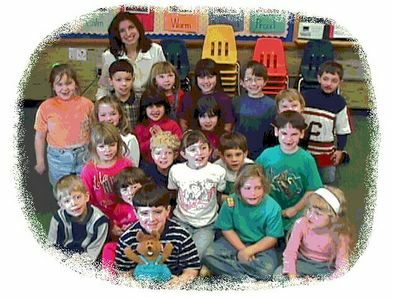 When I got home I found the school had their own website, whereon, I found this picture… a picture of kids now attending the very same classrooms I did. No, past the idea that they go to that school and inhabit the physical places of all those memories, I don’t know who they are. And frankly, for this purpose, it doesn’t matter. What I do know, what matters here, is what I can see. I see an awful lot of myself and my classmates in these kids’ faces. What will these kids be doing in 40 years or so? What kind of world will they know? I wonder if some of these kids, 30 or 40 years hence will come up to the building some Saturday, lost in their own memories, looking the place over. The names change… and faces do as well. The personalities sometimes change too, and so does the physical plant, over the years. At a more basic level though, things are still pretty much the same at my old school, best I can tell. The kids and the teachers each have challanges and thrils and make memories and freinds and learning to last a lifetime. Hayward is right, of course; you really can’t go back… except in memory. But it’s nice to know someone else is living in a reality that so closely mirrors my memory. And somehow, that continuity, in this changing world, is reassuring on levels I can’t begin to describe to you. I somehow doubt somehow I need to, however. If you’ve made it this far in this text, you know what I’m talking about.